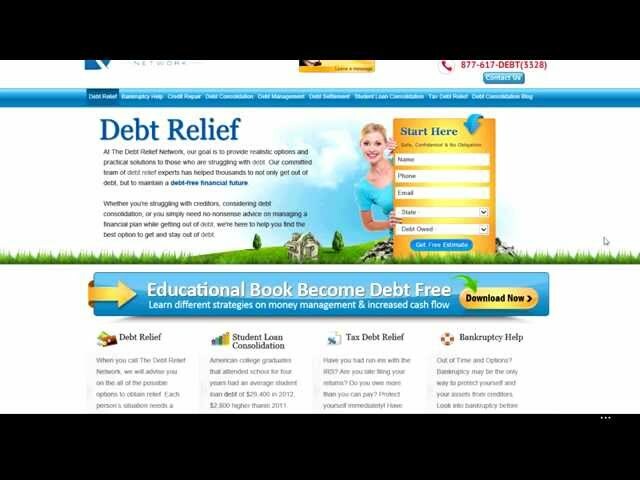 Debt Relief Network is a credit counseling and debt management service. Debt Relief Network is not a loan company, but a debt relief services company ready to offer multiple options for dealing with your debt problem. Debt Relief Network was founded in 2001, and provides services in debt relief, bankruptcy help, credit repair, debt consolidation, debt management, debt settlement, student loan consolidation and tax debt relief. The company has lawyers, CPAs, and debt consultants who will work to provide a solution to what ever your debt problem is. Since Debt Relief Network has several debt relief options, the exact process will depend upon which method is used. You will complete a brief application on the website. A debt specialist will evaluate your information, and make a recommendation as to which course of action should be pursued. If it is a debt settlement or debt management plan, you will be set up with a monthly payment plan, in which your payments will be placed in a settlement account that is in your name. Your debt specialist will negotiate with your creditors to lower settlement balances. The settlement account will be used as the source of funds to negotiate and settle account balances for less than the full face amount. Fees paid to Debt Relief Network will only be collected on the debts that have actually been settled. Debt Relief Network is almost unique by virtue of the many debt relief options they provide. They essentially act in the role of a credit counseling service, providing you with all the options for dealing with your debt. The fee structure is reasonable for the debt settlement industry, and the company will only collect fees based on the debts settled. And you always have the option to withdraw without further obligation. Debt Relief Network has an A+ rating from the Better Business Bureau since March of 2011. Specific fees may be determined by the type of debt relief you choose, as well as the state in which you live. On average, Debt Relief Network charges a flat fee of 20% of the total amount of debt enrolled. However, no fee is collected until debts are settled. You can cancel the service at any time without having to pay a fee on unsettled debts, since the funds are in your settlement account, which is held in your own name. Debt Relief Network has earned the top rating of A+ from the Better Business Bureau, which is formulated based on customer input, including problem resolution. Their staff includes professions, such as attorneys and CPAs, as well as knowledgeable consultants. The website itself is a rich source of information in regard to the various ways to deal with debt problems. There’s also a very informative debt consolidation blog. The company can be contacted by mail, by email and by toll-free phone.